Nice subject....right? Since I live out in the sticks, there are no services here except power and phone. I have my own well, propane tanks, and septic system. 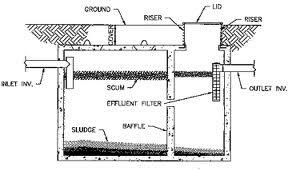 Since it's a relatively new septic system, it has all the new and improved features. This usually means there is more to worry about and take care of, and at least in my case, this is certainly true. My first problem came a few years ago when sewage backed up into the house. Since I had only a general idea where the tank was actually located, the service guy had to hunt a while to find the access ports on the tank. 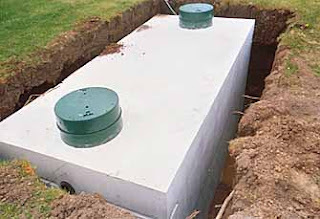 See, newer septic tanks have two access points for different stages of sewage treatment and both of them have to be pumped out. When he uncovered it, I found out I had a filter inside the tank. Except I have a riser on both sides so each tank can be easily pumped out. Notice the 'sanitary tee' on the inlet side? That causes problems as well; more on that below. Fast forward a year. I had company with kids and the darn tank filled up again. I opened the wonderful new access points, and sure enough, the tank was full again. Called the same service company and they came out and cleaned it out for me again. I chose this solution to get the house working again since I had company at the house that needed to use the bathroom. Total bill, $340. A couple of weeks ago, it happened again. This time I didn't have company, so I went out and cleaned the filter. The tank immediately started to drain into the leach field and drop the level, and by the next day, it was back to a normal level. No costs, this is the way to do it. However, about four days later the house backed up again. When I opened the access point, the tank was at the proper level, and the filter was clean. What the heck was up with that? Seems when the tank was full, a clot of toilet paper formed on the inlet side and had turned to concrete. See, what happens is that the 'sanitary tee' caught all the toilet paper and allowed a plug to form on the inlet. When I lowered the level of the tank, the plug hardened and I had a new problem to deal with. I spent most of the day with a water hose and jet nozzle breaking up the plug and restoring septic service to the house. This needs some solution that doesn't require me to remember that the darn filter needs to be cleaned, and a way of clearing the pipes that doesn't entail a days work with a water hose. This is a hose and special jet that you hook to your power washer and run through the sewer system to clear out clogs. 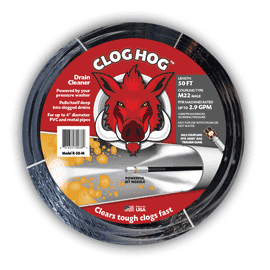 It won't work on tree roots or cave ins, but it will clear most clogs quite nicely. Since I had never used one before, I was skeptical, but it did a great job. It pulls itself along breaking up stuff and washing it down the sewer line. If it stops at a bend or a clog, just pull it back a little bit and let it go; it will work its way through the clog and around the corner after a couple of tries. Really nice tool. Total time to clean out the pipes was around 30 minutes and most of that was figuring out how to hook the device up to the power washer. 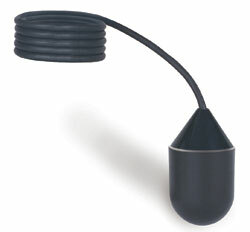 This is a normally closed float switch. I chose normally closed so that I would know that the level was OK by a closure and it would open when the level got too high. This way I knew the switch was OK and wouldn't have to wait for the sewer to back up to find out the switch was broken. Total cost for both items: $150 including shipping. I consider this a wise investment since now I can tell if the tank is rising and clean the filter long before it backs up into the house. I also have a way of clearing the pipe easily each time I open up the tank to prevent the toilet-paper-turned-to-concrete-plug problem. Sure, I could just clean the filter every six months or so, but who remembers that kind of thing? Especially since this is probably the nastiest job one can take on around the house. 'Sanitary tee' ? Who the heck thought of that name? I haven't hooked the float into the house network yet, but that will come over the next month or so. That's a problem that I already know how to deal with. I plan on having a little light come on somewhere inside the house that I can't ignore; heck, I may have it send me email also. I have the coolest septic tank in the area. Bloody heck, every septic I've seen has just been a concrete tank in the ground. Mind you I haven't looked for years, or maybe the US regulations are much stricter. It varies state by state, and some times county by county in the US. If I were to move 10 miles North, I would have a concrete tank in the ground without all the other stuff. 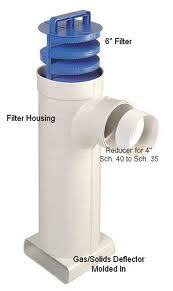 If I need to get my septic tank pumped, is cleaning the filter step one? The way you describe it, it sounds like a simple cleaning process. I have never had a septic tank pumped before. I'm sure I am like anyone and don't want to end up wrecking my own septic system. Wish me luck. This is probably the cleverest spam message I've gotten here. Notice the link at the end? A sure fire way to tell if it's spam. However, it does bring up the point that messing with your septic could screw it up ?!? Fat chance. These things are made out of concrete or high quality plastic, they can take a car running over the top, they are made to last a century. Just pull the cover off and see if you have a filter, if you do, clean it. If you don't look around for other causes. A little looking around can save you hundreds of dollars. Oh, and ignore the spam. Yes there is. Simply call the permit department in your area and the can tell you what kind of system you have.